Following the 1995 publication of my first book [amazon_link id=”0817354115″ target=”_blank” container=”” container_class=”” ]The Struggle for the Georgia Coast[/amazon_link], in which I presented the results of new research into Georgia’s coastal missions (based in large part on previously undiscovered or unused Spanish documentary sources), I began to realize the enormous quantity of published literature about early colonial Georgia that is now out of date. Most of the most accessible literature in tourist guides, state and county histories (including books and now web pages), and even state historical markers is based on very early research (much of which can ultimately be traced to the 1929 volume Georgia’s Spanish Missions by John Tate Lanning), and thus does not take advantage of more recent discoveries and interpretations. 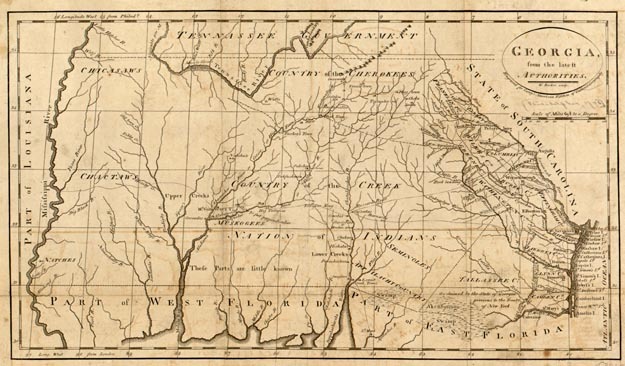 While this is mainly due to the fact that the newer information has yet to become widely accessible, I am often frustrated by the continual re-appearance of several prominent myths regarding early colonial Georgia. For this reason, I have assembled this FAQ page (and indeed the entire Georgia Before Oglethorpe site) in order to provide unambiguous answers to some of the more deeply-embedded myths and errors in published literature. In response to the many emailed questions about later periods in Georgia’s history as a colony and state, I have also included a set of links at the end of my Links page directing visitors to information about Oglethorpe’s Georgia. Q: Which term is more correct, “NATIVE AMERICAN” or “INDIAN”? A: Neither one; both terms are of European origin, and there never any universal indigenous name for all peoples living in North and South America. A common question nowadays is whether it is preferable to use the term “NATIVE AMERICAN” or “INDIAN.” The real answer is that while living individuals or groups may have personal preferences, neither term is more accurate than the other, and both terms have nothing to do with the original names that each group called themselves. The English term “INDIAN” is a translation of the Spanish term “INDIO” (the Spanish were, of course, here long before the English), which during the colonial era simply referred to any resident of “LAS INDIAS,” or “THE INDIES.” And this Spanish geographic name for North and South America was a result of Christopher Columbus’ colossal error in presuming that he had circumnavigated the globe in 1492 to arrive at islands off INDIA in Southeast Asia (it is a modern myth that the Spanish term “INDIOS” was somehow connected to the term “DIOS,” referring to God). But by the same token, the term “NATIVE AMERICAN” derives from yet another European name for the Indies, which was “AMERICA.” This term refers to the Italian explorer AMERIGO VESPUCCI, whose published account of his second voyage to South America in 1501-1502 in the service of Portugal led geographer Martin Waldseemüller to propose the name “AMERICA” for the New World in 1507. Q: What was the original Indian name for Georgia’s coast? A: There was no universal name; the two chiefdoms of MOCAMA and GUALE inhabited the coastline during the early colonial era. Almost every modern published work regarding the scenic Georgia coast asserts that the entire Georgia coast (Savannah to St. Marys) was originally called GUALE (pronounced “wallie”). 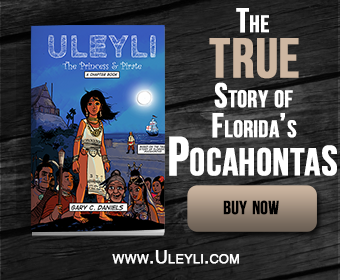 This is a myth, because in truth, there was no universal indigenous name for the Georgia coast, and GUALE was actually an Indian chiefdom which extended only from about the mouth of the Ogeechee River (just south of present-day Savannah) to the middle of the Georgia coast at the mouth of the Altamaha River (at present-day Darien). The GUALE province therefore only included the islands of Ossabaw, St. Catherines, and Sapelo (and their smaller neighbors), as well as the mainland estuaries and river valleys opposite these islands. The entire southern coast of Georgia was inhabited by a completely distinct chiefdom ultimately known as MOCAMA, which extended from the mouth of the Altamaha River all the way down to the mouth of the St. Johns River near present-day Jacksonville, Florida. The MOCAMA province included the islands of St. Simons, Jekyll, and Cumberland, as well as the mainland opposite them. Not only did the MOCAMA speak a totally different language (Timucuan) than the GUALE (Muskogean), but they also found themselves at war with one another during the 1597 GUALE rebellion, when GUALE Indians launched an assault on the capital-town of the Spanish-allied MOCAMA province on Cumberland Island. Q: What was the original name of St. Simons Island, where James Oglethorpe founded Fort Frederica in 1736? Although most published literature designates St. Simons as the island of ASAO, this is false. This name was actually associated with a Guale village and mission originally located near Darien on the mainland, and which was intentionally relocated to the northern end of St. Simons Island in 1661 after the mission’s destruction by English-allied slave raiders (the Westo of Carolina fame, otherwise known as the Chichimeco). In actuality, St. Simons Island was originally called the island of GUADALQUINI in deference to the capital town of the local chiefdom by that name located on the southern end of the island near the present-day lighthouse. As a side-note, the modern name of St. Simons Island comes from the short-lived Yamassee Indian village known as SAN SIMON, which was established by refugees from the town called Colon (originally located along the lower South Carolina or upper Georgia coast) during the late 1660s, and which was finally abandoned in 1684. Q: What was the original name for Jekyll Island, renamed by Oglethorpe in 1736 in honor of Dr. Joseph Jekyll in England? A: The Spanish called it ISLA DE BALLENAS, or “WHALE ISLAND”; there is no record of an Indian name. Despite various published sources which assert that Jekyll Island was originally called OSPO (a Guale town actually located originally on the southern end of Sapelo Island), or SANTIAGO DE OCONE (a Timucuan mission actually located in the heart of the Okefenokee Swamp on the mainland), or even GUADALQUINI (a Mocama town actually located on St. Simons Island to the immediate north), Spanish sources make it clear that there was no major indigenous name for Jekyll Island, apparently because it had no large or politically-significant towns, and only minor population. As a result of this fact, Jekyll was the only island on the southern Georgia coast that never had a Spanish mission, and the Spaniards simply used the name ISLA DE BALLENAS, meaning “WHALE ISLAND,” in deference to the fact that the waters in this area were (and are to this day) important breeding grounds for Georgia’s right whales. Q: How did the Altamaha River get its name, and what does it mean? A: The river took its name from an immigrant Yamassee group descended from an interior chiefdom originally known as ALTAMAHA, or TAMA; the river was known as SANTA ISABEL to earlier Spaniards. Despite a popular misconception that the present-day name for the river was its original name, and means “path to Tama,” the name ALTAMAHA was originally associated with a prehistoric chiefdom by the same name situated along the Oconee River just below Milledgeville, and visited there by Hernando de Soto in 1540. The ALTAMAHA chiefdom survived in the deep interior until Indian slave-raiders known as the Westo/Chichimeco forced them as refugees to the lower South Carolina/upper Georgia coast by 1663, after which they resettled among the abandoned Mocama missions on Amelia Island until 1683, when they fled north to the southern part of Carolina territory (St. Helena Island) and eventually became slave-raiders for the English. In 1715, Chief ALTAMAHA and the rest of the Yamassee rebelled against the English, and following Carolina reprisals the ALTAMAHA town finally settled as a Yamassee mission next to St. Augustine, where its converted Christian chief and some 80 surviving town inhabitants remained until the Spanish evacuation to Cuba in 1763. 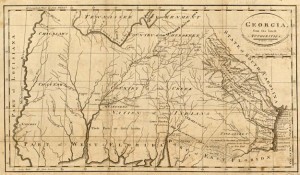 The original name for the ALTAMAHA River is not known, although the Spanish referred to it throughout the 17th century as the RIO DE SANTA ISABEL, referring to an early mission called SANTA ISABEL DE UTINAHICA established in the Timucuan chiefdom of UTINAHICA located at the forks of the river (near present-day Lumber City). Q: What was the origin of the term “Creek Indians”? A: The name Creek comes from “OCHESE CREEK,” the English rendering of the indigenous name for the Ocmulgee River. A persistent myth about the Creek Indians (the Muskogee) is that their name came from the fact that they typically lived along creeks (which was true for most Southeastern Indians, particularly after the development of agriculture). The name “Creek Indians” actually derives from the indigenous name for what is now called the Ocmulgee River, which English colonists rendered as “OCHESE CREEK,” and which colonial Spaniards referred to as “UCHISE” (a common Spanish name for the Lower Creeks during the period ca. 1689-1715 was the “Uchise Indians”). The name itself ultimately derived from the prehistoric chiefdom of ICHISI, the capitol of which was visited in 1540 by Hernando de Soto at the Lamar mounds site along the Ocmulgee River just below Macon. While it is remotely possible that remnants of the chiefdom and town of ICHISI survived along the Ocmulgee until the late 17th century, it was not until after the ca. 1689 immigration of nearly a dozen individual towns from the lower Chattahoochee River to the Ocmulgee that this name ultimately became attached to the lower division of the emergent Muskogee confederacy under the leadership of the Coweta and Kasihta towns (the Lower Creeks). One of those towns, called OCMULGEE, was established on the abandoned site of the prehistoric Macon Plateau mounds (then six centuries old), and later lent its name to the river formerly known as OCHESE/UCHISE. Q: What was the origin of the name of the Savannah River? A: The river took its name from an immigrant band of Shawnee Indians who settled near the site of present-day Augusta in 1681. The Savannah River derived its modern name from a group of immigrant Indians known as the SAVANNAH (or SAVANA), who helped the Carolina colonists destroy the Westo-Chichimeco there in 1681, and who subsequently acted as slave-raiders on behalf of the English. Contemporary documents confirm that the Savana were in fact a band of SHAWNEE Indians who originally moved to this region from much farther west (probably the Cumberland River region). By at least as early as 1707, some of the SAVANNAH had moved north to the Susquehanna River in Pennsylvania, and not long after the 1715 Yamassee War, their towns near present-day Augusta were abandoned. This same river had formerly been known as the WESTO River during that group’s stay between 1661 and 1681. Prior to this time, Spanish sailors simply called the river’s mouth the BAHIA DE LOS BAJOS, or “BAY OF SHOALS,” but there is no clear evidence for an “original” indigenous name for the river, since most of the valley had been largely abandoned for centuries by the time of first European contact. John E. Worth is an Assistant Professor of Anthropology at the University of West Florida. He is an anthropologist specializing in archaeology and ethnohistory, with a primary research focus on the European colonial era in the Southeastern United States. He has served as anthropologist at the Fernbank Museum of Natural History in Atlanta and at the Pineland Site in Florida. He is the author of "The Struggle for the Georgia Coast: An Eighteenth-Century Spanish Retrospective on Guale and Mocama" (1995), "Timucuan Chiefdoms of Spanish Florida: Volume 1 & Volume 2," and many articles and book chapters.